Have you ever wondered if the on-page SEO tips that experts are recommending actually work? I mean, does using your target keyword in your URL really have an impact on SEO? Does site speed really play a factor in rankings? In this article, I’m going to break down the top on-page SEO techniques that you can use to get higher rankings in Google, backed by hard cold data. We have a lot of solid on-page SEO techniques to cover so let’s get this party started with our top 10 tips. #10: Use short URLs for your pages. So true or false? Do short URLs rank better in Google? Our study on on-page SEO factors shows that on average, short URLs with a median of around 17 or so characters ranked visibly better than long ones. 9#: Use your primary keyword in your URL. So does this actually help you rank high in Google? The answer according to our study is. . . False. Interestingly, out of all keyword-related on-page SEO factors that we studied, this was the only one that showed a negative correlation. In fact, John Mueller from Google went on the record and said:”I believe that is a very small ranking factor. So it is not something I’d really try to force. And it is not something I’d say is even worth your effort to restructure your site just so you can get keywords in your URL. “But do I recommend using it? Absolutely. Two reasons: When your link gets shared, people can easily identify what the page is about without even clicking through to the page. This should increase referral traffic compared to having links that look like this. The second reason: the exact match keyword that you want to rank for will be included in the anchor text of every naked URL backlink that you get. And we did a study on anchor texts, which shows that top ranking pages tend to have a larger percentage of exact match anchor text links in their backlink profile. So take 10 seconds to customize your URLs and reap the benefits. #8: Use your keyword in the headline, so the H1 tag. In our study, we found that around 85% of pages that rank in the top 10 of Google, don't have their keyword in their H1 tags. But there was still a small correlation, so I still recommend using various keywords in your headings and even subheadings. And the main reason for this is more user experience based. A study from Neilsen Norman Group found that on average, a user will read, at most, 28%of the words on a page. But then they said that 20% is more realistic. Here’s the thing: Scanning text is an extremely common behavior for users. You probably look at a page, scroll for a bit, and if something pops out to you, you read that section. And if you think that section was awesome, then you think: oh shoot, did I miss out on anything else? So you scroll back up and then you read the post. Using trigger-like keyword phrases in headings and sub-headings may be enough to pique a user's interest and have them stick around a little bit longer. #7: add external links to authoritative websites. Again, John Mueller said that adding external links to other sites is not a ranking factor in Google’s algorithm. But Reboot Online’s study disagrees. They ran a fun little experiment on these two completely made up words, which I won't even attempt to pronounce. They set up 10 different websites, 5 that linked to authoritative sources like Oxford, Cambridge, and genome. gov. And then the other 5, they had no external links at all. And the results were clear: the sites that contained external links, ranked higher than the ones that didn’t for both keywords. In our own study, we found a small positive correlation of pages that link to Domain Rating 70+ sites ranked in the top 10 of Google. So here’s an easy takeaway. Don’t be afraid to link out to other resources that will enhance the experience for your readers. For example: If you’re writing a blog post on the best golf gear and you found a great comparison of golf balls, then link out to them. But don’t just do it for the sake of it. #6: Add internal links to pages that you want to rank. Internal links are links that go from one page on a domain to a different page on the same website. And these have been proven time and time again to help with rankings. So a quick tip is to look at your pages that are currently ranking on page 2 of Google, add some internal links to relevant pages that you want to rank, and hopefully, it'll enough to give your pages a small boost in rankings. You can find pages that rank on page 2 by going to Google Search Console, click on search traffic, and then search analytics. Then make sure you check these boxes up here, and then sort the positions in descending order. You can quickly scan through the impressions column and try to spot bigger numbers, which suggests that there’s a higher search volume. But these are average positions, which isn’t very accurate. You can do this more effectively using Ahrefs’ Site Explorer tool. Just type in your domain or a subfolder. So I’ll use ahrefs and run the search. Next, go to the Organic Keywords report. Here, you can see all of the keywords that your blog ranks for. So I’ll narrow down our results by setting the positions filter to only show keywords that rank in positions “x” to “x”. And you will see that your post on SEO tools ranks in position “x” with “x” monthly searches. So here you would find a great target to point some internal links too. Now we need to find pages where we can add these links. You can do this by going to Google and type in a search query like: site:yourwebsite.com/blog/, and you can add “your keyword” in quotes for a phrase match search. You can see that there are a good number of pages where we can add internal links from. Clicking through to this page, and then doing a find for “your keyword” you can see that this would be a great place to add the link. #5: Re-optimize titles on under performing page one rankings. First, you need to identify the pages that are ranking on page one. Again, you can do this in Google Search Console and look through the different positions versus click-through rates. And as a very general benchmark, the #1 ranking spot sees an average CTR of 33%, #2 gets 15%and #3 gets around 10%. If you see anything below that, make a note of it and start playing around with your titles and meta descriptions. Here are a couple of ways to get some great ideas for new titles. Let’s say that I’m creating an epic post on hotels in San Francisco. Looking at the organic Google search results, you can see that they appear to mostly list posts of the top or best ones. And two of them actually include prices in the title. This can tell you a lot about the intent behind a searcher’s query. So you might want to create yours in a similar way. Next, look at the ads. Since a lot of the big players are constantly experimenting with ad copy, you can bet that for high CPC terms like this, you’ll find some solid title and description ideas that can boost your CTR. There’s an awesome data-driven way you can do this too. I’ll click through to this ad. Next, I’ll copy the URL without the parameters. Then I’ll go to Ahrefs' Site Explorer tool and paste the URL here and run the search. After the page loads, click on “ads” under the paid search category. And right away, you can see all of the different ad variations and see which ones have been attracting the most clicks for them. If you’re still stuck, borrow some ideas from viral sites like Upworthy or Buzzfeed. For example, if I do a google search for site: BuzzFeed. com “San Francisco” hotels, you’ll see a few cool ideas that you can work into your title tag. People have been raving about “long-form content” for quite some time. In fact, our study showed that content length had the second best correlation across all on-page SEO factors that we studied. But how long is “long-form?” 1,500? 2,000?5,000 words? We found the median value for a #1 ranking result to have 800 words, which I don't think quite fits into the category of “long-form.” So instead of focusing on word count, focus on coverage. For example, if you're writing a piece on making the perfect cup of coffee, you can just say, say: “grab a Kcup, put it in the machine and wait.” If you truly want to deliver on making the perfect cup of coffee, you'd want to talk about beans, water temperature, brewing methods like a French press, drip, or using an Aeropress. An easy way to find related subtopics is to Google the keyword phrase you want to rank for and skim through the sub-headings from the top ranking pages. Clicking through to this one, you’ll see that they covered a few different methods like pour overs, French Press and Aeropress. And on top of that, they included a helpful bullet point list for each method with preferred types of beans, brewing time, and flavor profiles you should look for. To expand your coverage, you can copy the URL and paste it into Ahrefs' Site Explorer. Next, click on the Organic Keywords report in the sidebar. And on this page, you can see all of the keywords that this page ranks for in Google. So bottom line? Forget word count and focus on covering the topics and sub-topics that will serve the searcher's intent. #3: Use modifiers in your titles. Modifiers are add-on words to a base keyword. My favorites are best, top, buy, and the current year. A super cool way to find modifier keywords that actually have search volume is to type in a seed keyword in Keywords Explorer. Next, go to the phrase match report in the sidebar. And you can see that there are well over 2 million keywords with the keyword golf in it. Next, click on the include search box and type in a modifier keyword like best. You can see that there are some great keyword ideas where you can add modifiers to your title. Best of all, for the golf niche, the keyword difficulty scores are extremely low on these, which makes them potentially great keyword targets that you can go after. #2: Don’t have slow loading pages. In 2010, Google announced a new signal in their search ranking algorithms: page speed. And as of this month, July 2018, page speed will become a ranking factor for mobile searches. But according to the results of our research, the correlation of this on page factor with higher positions in Google is very small. So should you even bother optimizing for page speed? Absolutely! Google performed a study on 11 million mobile ads and found that as page load time goes from 1 to 3 seconds, the probability of bounce increases by 32%. And as the load time increases, so does the probability of bounce. First, go to Google Pagespeed Insights and enter in the URL that you want to analyze. You can toggle between your mobile and desktop page speeds here. Then scroll down a bit to see the optimization suggestions. Often, you’ll see that slower page speeds are attributed to files like images, scripts, and style sheets. You can click here to download optimized versions of these and make the appropriate replacements your page. Next tip, use a content delivery network (or a CDN). For example, if your hosting server is located in New York, but your visitor is in Australia, it can take quite a bit of time for the transfer of data to complete. CDNs minimize the distance between where the visitor is browsing from and where your website server is hosted. The next tip is to use an image compressor. Images in their raw form, they can be quite large. So you can use a tool like Shortpixel to optimize your images for the web. I’ll just drag and drop a picture of this handsome fella here and soon after, you can see that it compresses the image by quite a lot. Final page speed tip is to cache, cache, cache! If you’re a WordPress user, you can use plugins like W3 Total Cache and get a solid configuration without a technical bone in your body. And finally #1: Improve your UX by enhancing your UI. This last tip almost summarizes all of the on-page SEO factors into one. So Google’s job is to provide the best results to their users for any given search query. In order to help Google achieve that, you need to foster that user experience for their visitors. Aside from the content itself, the user interface, or the way the page looks, can have a significant impact on how people interact with your site. First is to improve visual readability. If you look at these two pages side-by-side, which one is easier to read? Obviously the first one. Let me break this down for this article which is about how to write a resume. They use a readable font-size, they write in short sentences and short paragraphs, they have standout images like this one that instantly connects with the someone wanting to learn how to write a resume. They have nice little breaks for checklists and pro tips making it hyper-scannable. And they provide some solid visual examples of what a resume should look like. Some other tips to improve user experience through your user interface is to include a table of contents for long posts like this. You can even make it scroll down with the user so it’s easy for them to jump to different sections. And the final one that I think will gain popularity over time is to include an interactive feature within your blog posts. You can do this in simple ways by sharing a slide deck, videos, surveys, polls, and more complex ways like interactive tools. If you enjoyed this article or have questions, be sure to comment below. Many thanks for this Awesome article. I really found it helpful. I hope you focus on the #1 advice (IMPROVE YOUR UX BY ENHANCING YOUR UI) in your article by adding images and videos that discuss the examples because I think there are missing images here. My question is about the advice 9# (USE YOUR PRIMARY KEYWORD IN YOUR URL). I have an Arabic blog and confused between using the Arabic primary keyword or the translated one. When using the Arabic one, and when any visitor shares the article, the Arabic letters convert to strange numbers. So, what is your advice? 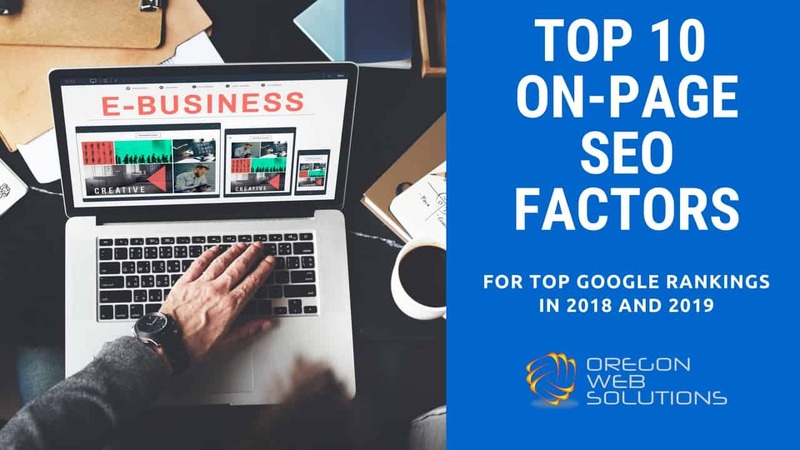 Top 10 On Page SEO Factors For 2018-2019	Overall rating:	5	out of 5 based on 48	reviews.